Jessica Angel's design uses the story of the Ten Chinese Suns, in which all suns belonging to the ten Chinese days decided to go out at once, heating the earth and killing the crops. 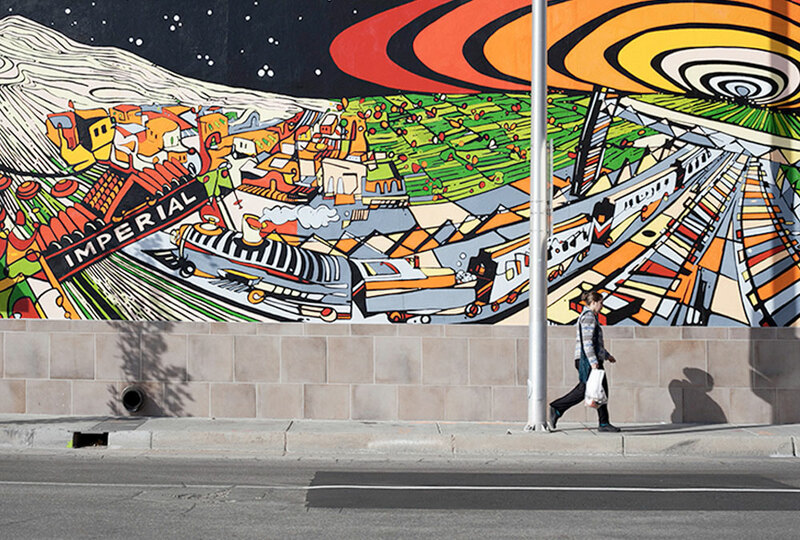 This mural design shows the fall of these suns into the night, bringing a dynamic change to Downtown Albuquerque, fostering the advent of an era with healthy food and accessible housing, paying tribute to the past while celebrating the future of this community. Jessica Angel is a Colombian artist living in Brooklyn, NY, and received her degree in Visual Art from the Universidad Nacional de Colombia. She was awarded the Studios at MASS MoCA residency in 2016 and the Teaching-Artist Residency at The Cooper Union in 2012. 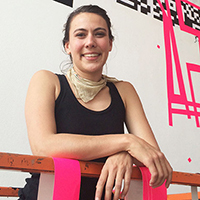 Angel maintains an active relationship with her hometown of Bogota, where she received the Art and Science Award with IDARTES in 2015 and "El Parqueadero" Laboratories fellowship in 2013. She has exhibited locally and abroad in cities and countries such as Bogota, Mexico, Miami, Washington, Denver, Albuquerque and New York.